吳亭葦 – “Cerebral Mechanisms for the Habituation of Pain – an fMRI study." 黃正維 – “Neural mechanisms for the somatosensory abnormalities in Parkinson’s disease: an fMRI study." 周潔 – “Identification of the Pathological Impact of ASD-related Copy Number Variations." 楊松陵 – “Neuro correlates for the perceptual decision making of pain." 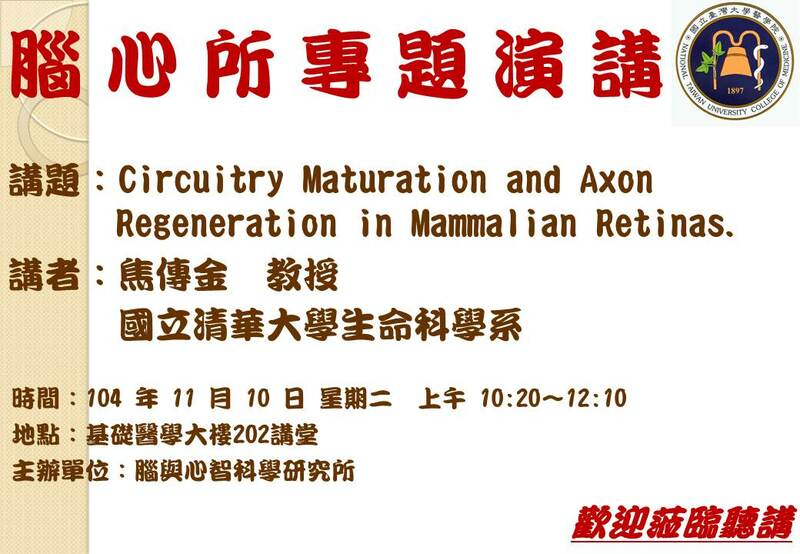 黃得峰 – “The Roles of RBFOX3 in Neuronal Circuitry — the Molecular and Cellular Investigation." 黃旭家 – “Self-location and body-location: are they the same?" 陳文佑 – “Body ownership and the four-hand illusion." 黃稚倫 – “Gamma Band Oscillations to Reveal Neural Network Cortical Coherence Dysfunction in Autism Spectrum Disorder." 蔡依璇 – “Functional study of mINDY in the central nervous system of mice." 林孟穎 – “The role of Rtl1 in the mouse brain." 葉昇蓉 – “Nutrient manipulation affects sexual preference in Drosophila melanogaster."